A novel soft-decision decoding algorithm for Reed-Solomon codes over GF(2 m ) is proposed, which is based on representing them as polar codes with dynamic frozen symbols and applying the successive cancellation method. A further performance improvement is obtained by exploiting multiple permutations of codewords which are taken from the automorphism group of Reed-Muller codes. It is also shown that the proposed algorithm can be simplified in the case of decoding a binary image of the Reed-Solomon code. Original Russian Text © P.V. 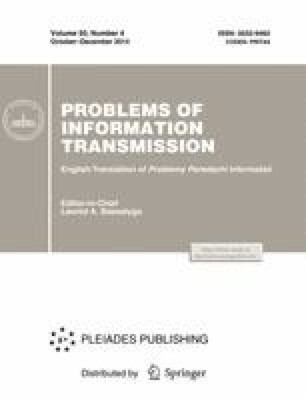 Trifonov, 2014, published in Problemy Peredachi Informatsii, 2014, Vol. 50, No. 4, pp. 3–14. Supported in part by the Russian Foundation for Basic Research, project no. 12-01-00365.